Liposome-formulated drug samples may contain free (non-encapsulated) drug molecules that are not encapsulated within the liposomes. Encapsulated drugs may leak out of liposomes during storage or due to exposure of the liposomes to organic solvent, ultrasound vibration or freezing or elevated temperatures. 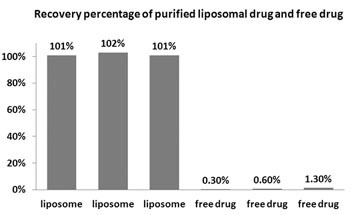 During production of liposomal drugs, drug loading may not be complete leaving certain percentage of the drug non-encapsulated. The Liposome Drug Encapsulation Assay kit (Catalog number LDE10) is designed to analyze the percentage of drug encapsulation in liposomes. The kit is based on spin-column separation of the liposomes from the non-encapsulated drug molecules. It recovers 100 % ±2 % liposomes and removes > 98% non-encapsulated drugs. The complete separation between the liposomes and the non-encapsulated drug is based on a combination effect of absorbance and size between liposomes and non-encapsulated drug molecules. The Liposome Drug Encapsulation Assay kit (Catalog number LDE10) includes 30 pre-packed spin-columns and 10 ml of elution buffer. It is for measurement of drug encapsulation of 10 liposome samples.